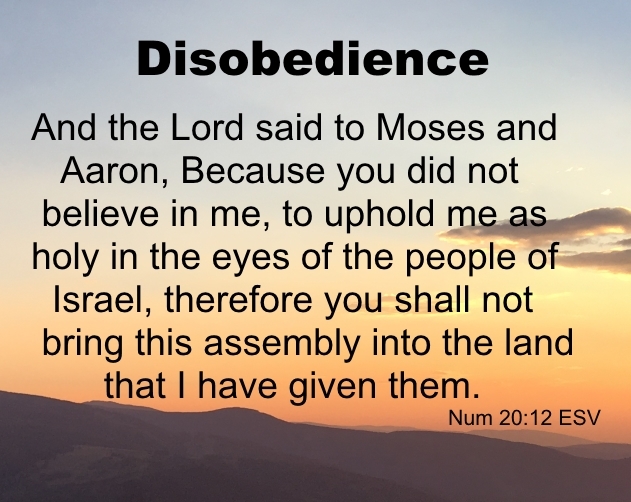 Disobedience to God's commands or instructions will always take a person to a place where they don't want to go. The Exodus of the Israelites out of Egypt is a great illustration of this principle. 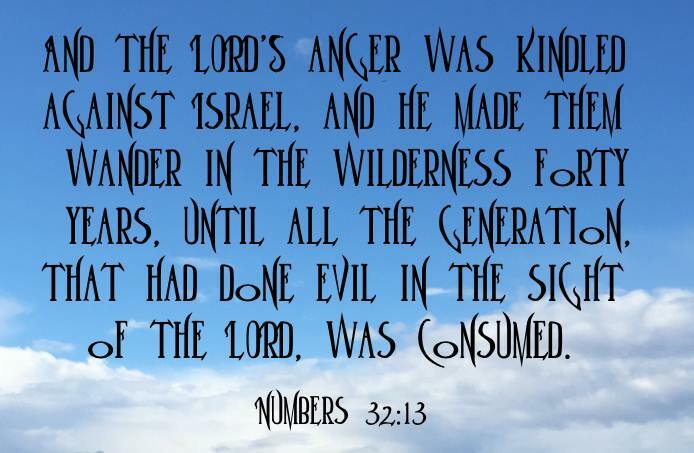 And the LORD'S anger was kindled against Israel, and he made them wander in the wilderness forty years, until all the generation, that had done evil in the sight of the LORD, was consumed (Numbers 32:13). And the space in which we came from Kadeshbarnea, until we were come over the brook Zered, was thirty and eight years; until all the generation of the men of war were wasted out from among the host, as the Lord sware unto them (Deuteronomy 2:14). And the Lord spake unto Moses, saying, Take the rod, and gather thou the assembly together, thou, and Aaron thy brother, and speak ye unto the rock before their eyes; and it shall give forth his water, and thou shalt bring forth to them water out of the rock: so thou shalt give the congregation and their beasts drink. (Numbers 20:7-8). And Moses and Aaron gathered the congregation together before the rock, and he said unto them, Hear now, ye rebels; must we fetch you water out of this rock? And Moses lifted up his hand, and with his rod he smote the rock twice: and the water came out abundantly, and the congregation drank, and their beasts also (Numbers 20:9). And the Lord said to Moses and Aaron, Because you did not believe in me, to uphold me as holy in the eyes of the people of Israel, therefore you shall not bring this assembly into the land that I have given them (Numbers 20:12 ESV). And die on the mountain which you go up, and be gathered to your people, as Aaron your brother died in Mount Hor and was gathered to his people, because you broke faith with me in the midst of the people of Israel at the waters of Meribah-kadesh, in the wilderness of Zin, and because you did not treat me as holy in the midst of the people of Israel. For you shall see the land before you, but you shall not go there, into the land that I am giving to the people of Israel (Deuteronomy 32:50-52 ESV). In the first verse God said "you did not believe in me" and in the second verse "you broke faith with me". I believe what God is saying is that the root cause of Moses' loss of self-control, patience and his disobedience at Meribah was his lack of faith and unbelief. In the lessons on faith , believe and obedience, we see that obedience is a significant aspect of both faith and belief. When we don't obey God it is most likely because of our unbelief and our lack of faith in Him and His Word. Moses was chosen by God to lead His people and serve Him. These are some the scriptures that God has used to describe Moses - Exodus 3:6-10, Numbers 12:3, Deuteronomy 34:10-11, Joshua 3:7, 4:14, Psalm 106:23, John 5:46, Hebrews 3:5, Revelation 15:3, Acts 3:22. When we read these scriptures, we have to wonder why Moses was not allowed to enter the promised land. This should make us very mindful of the importance of obedience to God and the Word of God. We must take heed to not miss out on the promised land.